I can’t help it! I went to read the Creative Class blog, where I find all kinds of coolio urban trend stuff, and there it is—more transportation—The Great Car Reset by Richard Florida. My own #2 Daughter is part of this trend away from cars as the be-all, end-all for the next generation. She turns 16 in a matter of days. Family budget constraints are such that she had to choose between driver’s ed this summer and an advanced theater camp at the Spokane Civic Theater. She picked the camp; driving can wait. So not my attitude at her age, when I was especially annoyed that--because I started first grade at the age of five--I couldn't take driver's ed sophomore year with my friends. I had to wait until my junior year to turn 16 and grab those keys to freedom. I would call this next link the “great minds think alike” category but that would be utter hubris on my part. Still….. I started a draft blog post back in late April on the whole notion of ownership, which we’ve pretty well sanctified in U.S. society. I parked it in Blog/Drafts to come back to “someday” when the idea grabbed me again. Lo and behold, there goes Chris Brogan (a great social media guy whose work teaches me so much) responding to that same Richard Florida piece on cars and questioning the whole notion of ownership. Dang it. Then about 30 minutes later this turned up via Twitter: Millennials Are Not Romantic About Their Wheels. This transportation stuff follows me everywhere! So I finally got mine written and out there asking whether we can develop new models based on use without ownership. Being Productive on the Bus: You may remember from an earlier Light Reading that I just had to comment on a Planetizen post that seemed to treat all travel time as equal. This post, also on Planetizen, is the rebuttal from someone who, like me, considers transit time a great opportunity to read, deal with those pesky emails, and in general be more productive than I would be fuming behind the wheel at a red light. And while we're on the subject of time, a sort-of-related post: Money makes you less likely to savor small pleasures according to research reported at Miller-McCune, because you don’t slow down and savor the everyday joys. Since I don’t have much money, it’s a good thing I have some time. What about you--where do you find your happiness? What's the value of time? Real-time reviews of job applicants, or, I can be brutally honest. Just watch. What are we really thinking when we read your job application? For my stream of consciousness on applicants for a reasonably senior level communications job at a public research university, I share the tweets I sent out while reviewing 61 job applications. For advice on applying for a public-sector communications job at lengths much greater than 140 characters, see Public sector communications jobs 101. These are listed in the order in which I tweeted them, top to bottom. This is the reverse of the way you would read them if you scrolled back through my profile on that fine, fine day filled with so much joy at the incredible credentials and mad job-applying skills on parade. Thank heavens for coffee. Apparently it bears repeating: When filling out job app/writing cover ltr/updating resume, PROOFREAD. Espec for comm job. Gee whiz. If your cover ltr tells me "I am an experience communications professional" I don't believe you. Job hunters: Don't use grandiose language. 10 years does not="vast experience". It=delusions of grandeur. When applying for ANY job in public sector make sure you address EVERY component of job descrip in yr application. Why? At WSU we use numerical ranking/scoring sheet. I can't give you points if you don't tell me what you can do/have done. Another public-sector job hunting tip: Find & interview someone who has position like what you're applying for. Really. Trust me. Another job hunting tip: Don't use "insider" acronyms. Forces me to search to figure out what you're talking about. This makes me cranky. Job hunting tip: If job app form asks "reason for leaving" & you leave it blank, I can only speculate, & I have a healthy imagination. Job hunters: Use typefaces/fonts consistently on your resume. Please. & logical page breaks/header placement while you're at it. Job hunters: Do not get "creative" with punctuation. Using / as a separator all over your resume? Annoying. Job hunters: Love it love love it when your cover ltr blows me away. It is not just a transmittal & your resume won't do all the work. Job hunters in communications: We teach architecture @WSUSpokane. You are not a conversation architect. Trust me on this. Re last tweet: I tend to take exception to trendy jargony buzzwordy stuff in job applications. Maybe you noticed. Job hunters: Personally, I wouldn't put "conflicts w/supervisor" as reason for leaving a job. That spells Trouble with a capital T.
Job hunters: Use standard typefaces. Otherwise your accomplishments print out in Courier. Looks old-fashioned. Job hunters: The passive voice is to be avoided. Job hunters: Surprise! Leaving dates off resume to disguise short stints doesn't work if we also have you fill out job app form. Job hunters: If you say "freelancer" provide DETAIL: types of clients/projects/tasks/outcomes. Otherwise freelancer=unemployed. Getting what you want a different way: Can we create new models? My pondering on this topic began back in April prompted by a Cap’n Transit Rides Again piece on the trade-offs between desires, say, for big homes and lots of land that will require cars to move you around and how—cue Rolling Stones here—you can’t always get what you want (his follow-up post delves into the trade-offs between desires a bit more). I got re-prompted yesterday by Chris Brogan suggesting we may want to rethink every assumption—as it happens, also on the value of home ownership or car ownership—in response to Richard Florida talking about the Great Car Reset and a decline in driving among young people in particular. I find myself wondering about the inherent bias toward owning rather than renting or sharing. It's built into the tax code—I get to deduct my property taxes and mortgage interest. There are policy reasons stated for this; you’ll hear the assumption that neighborhoods get greater stability and attention to external maintenance from home owners than from renters. This ownership orientation in the tax code provides great encouragement for over-consumption of housing. Up to some limit in the tax code (I don’t know what it is and don’t ever expect to approach it), I get to deduct more and more if I buy bigger and bigger houses. In essence, people who own smaller, more compact homes (and consume fewer resources) subsidize someone else’s bigger house through this tax shift. A mildly radical notion submitted for your consideration: Is ownership the be-all and end-all? As new models emerge like Zipcar that enable the convenience of car use without the ongoing expenses of car ownership, maybe we'll see some shifts in this. Or to take it a step further, the Zimride model of ride-share matching through Facebook--all private owners willingly exchanging uses and needs. I wish my neighborhood (small houses close together within walking/biking distance of downtown and on a transit line) had a "big tool exchange" system whereby we don't all individually have to own a lawn mower, edger, hedge trimmer and all the other big, noisy accoutrements of lawn maintenance. Ninety-nine percent of the time we're not using these things so why couldn't someone else? But someone has to create, manage and fund such a system, as well as get everyone to change the psychological orientation toward ownership. That's a big job. This co-op mentality may be near-communism to some, and American individualism gets in the way. Perhaps the up side of the economic downturn is that people won't be able to afford all the ownership they want and will have to look for other models. Would you be willing to share ownership in things you don’t use very often? Do you know of models for things like the tool exchange I suggest? Are you changing your thinking about what you “have” to own? How do we pay for our transportation system? Surprise: In our health care system. At least in part, that is. Choices to drive rather than walk to the transit stop or ride a bike are choices in favor of a sedentary life. When you say yes to the car you say no to moving yourself with personal power and burning a few calories. 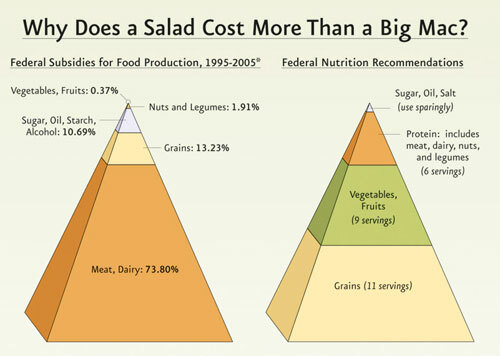 Cost shifts are also hidden in food prices thanks to agricultural subsidies for low-quality calories (think high-fructose corn syrup). Cheap bell peppers grown in Chile and shipped to Spokane undercut locally grown produce that doesn’t travel nearly as far. Soda costs less than fruit juice, which at least has some element of real food in it. Ever stop to wonder how that happens? Planetizen blogger Steven Polzin on The Cost of Slow Travel: Boy, did I ever have to comment on this one. Next American City panned the idea of “summer streets” efforts that don’t get people to think much, much differently about street design. What’s wrong with plain old fun, I ask? Our Spokane Summer Parkways will be plenty of fun, thank you very much. That isn’t what the Creative Class folks mean by density—they’re looking at how many smart people (college-educated) per square mile cities have as a measure of their human capital. Their piece is based on the original analysis by Rob Pitingolo, which turned out to have comments by people asking whether walkability scores and income-based mobility played any role in where smart people choose to live. Maybe everything is ultimately about transportation…. I know what you’re thinking. Poop jokes. Apparently so was Mr. Wayne Lawson of Spokane, who wrote a letter to the editor suggesting this choice indicated a decline in the moral environment. I'm a proud LC drama mom, and I only wish "Urinetown" had run more than one weekend so word of mouth could have spread. The place would have been packed night after night. 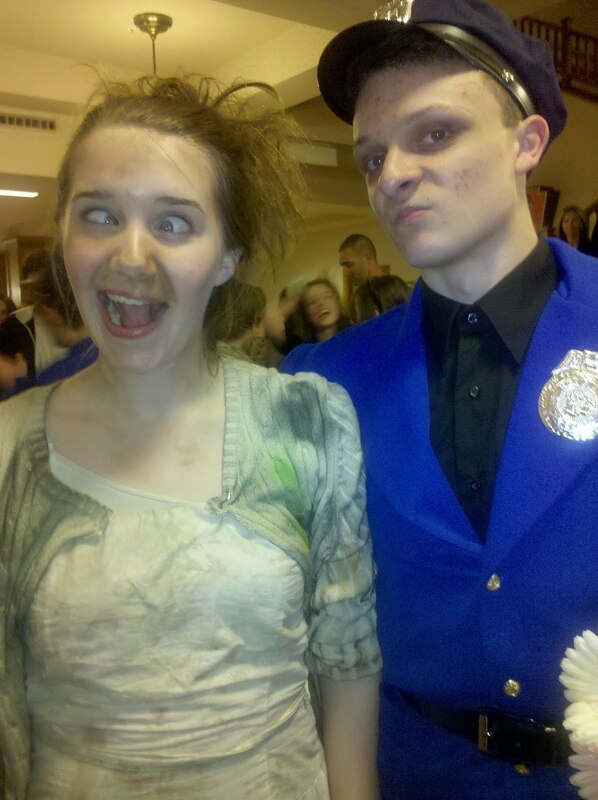 “Urinetown: the Musical” is a social satire and recipient of multiple Tony awards. It satirizes the legal system, capitalism, social irresponsibility, populism, bureaucracy, corporate mismanagement, and municipal politics. It is a commentary on morality, on humanity, and on love. Furthermore, it has a strong environmental message. Besides all the lessons in the story line, honestly, if you can get dozens of high school kids to stay hours after school, day after day, to rehearse, paint sets, and prepare, how can anyone complain? People who lament "kids these days" should see firsthand the dedication, work ethic and commitment demonstrated by students in drama and every other after-school activity. I think back to the hours of my life given to marching band (yes, I was a University High School Titan Band Jock) and track (not a standout) and how important the lessons were that I learned. If you miss a cue, keep going. That’s what high school drama is teaching our kids. I think that’s a major contribution to the “moral environment” that so worries Mr. Lawson. While you could (as I did) write a rebuttal to Mr. Lawson on the Spokesman website, you can do something far more meaningful. The Lewis & Clark drama program has been selected as one of 50 high school programs from the entire US to go to the American High School Theater Festival. It’s part of the Festival Fringe in Edinburgh, Scotland: the largest arts festival in the world. If you want to participate in the fundraising committee, let me know in the comments here or text your email to me at 509.869.2949. Several of us have already told drama teacher Greg Pschirrer that we’re all over this and we need your help. You can also follow them on Facebook and on YouTube. Young job seekers get advised by their teachers to do “informational interviews” to gain an understanding of job opportunities and expectations at a given workplace (and, secretly, in hopes of being top of mind if an opening comes up, which only works if you stay in touch following said interview). I always make myself available for these. I like sharing what I’ve learned (hence my addiction to Twitter, the ultimate sharing/learning space) and it makes for good karma. I work in a mid-sized city with approximately one and one-half degrees of separation and just about everyone in my profession knows everyone else, so it really does help people plug into the network of communications/PR/marketing folks. Based on what I’ve seen serving on quite a few search committees in the public sector, the informational-interview advice applies to everyone, not just those wet-behind-the-ears recent grads. This is particularly true for people seeking to move from the private sector into the public sector, or from a profession they believe is related to the position for which they are applying. The assumptions some of you make—honestly! I offer some basics here for your consideration. In another post I share some quite flippant remarks from the trenches tweeted in real time while I plowed through 61 applications in a row, fortified by coffee. Understand the job. Interview people doing the same thing or similar work, and people in the agency or institution you want to work for. If you can interview someone who left the job, even better. Really? Well, I’ve dealt with my doctor so that means I know how to perform surgery. I’ve dealt with my kid’s teacher so that means I know how to manage a room full of hormone-ridden, anxious teenagers. Understand the process. What are their hiring and screening procedures? Ask. Someone will tell you. Timelines can be really, really l-o-n-g. . . . Follow the process. We have to treat everyone going through it the same way so it doesn’t pay to try to end-run it. Remember, most hiring committees are looking for the fastest possible way to winnow the pile, and throwing out people who disregard procedures (especially for a job in the procedure-heavy public sector) is a really fast way to do so. Understand the position description (PD). Every element is in there for a reason. Sometimes the reasons were created by the last person in the position not performing as expected and the PD was updated to compensate. Understand the job of the reviewer. Address every element of the PD in your application. We don’t guess, we don’t read between the lines, we don’t give a lot of points for creativity if your creativity fails to help us understand your qualifications. Understand reality and demonstrate your firm grip on it. Don’t use superlatives or grandiose language. One application referred to “my vast experience.” This “vast experience” consisted of 10 years in a related field, but not doing anything like what the position called for. This is not vast experience, this is delusions of grandeur. Proofread, people, proofread! Really. Truly. When the first sentence of the cover letter starts out “I am an experience communications professional” I know you’re not. When you go on to use the word “experience” again in that sentence, I know you’re not a very good writer, either. If you get the interview, ask the names and titles of those you will be meeting with. This is generally not secret information. Prepare for the interview. Do some research. Come prepared to connect with the interviewers as individuals (just not in a creepy stalkerish way). Understand where they fit in the organization and how they will (or won’t) work on a regular basis with the position you want. This will frame their questions and how they process your answers. Hey, you may even be able to speak directly to something you know interests that person (hint: I like and utilize social media). Prepare some more for the interview. Come prepared to demonstrate that you have connected already with the institution. I still recall years ago when an internal candidate seeking a promotion flunked my question, which was to talk about the degrees offered by the unit in which she worked. How many times have people demonstrated that they haven’t even bothered to read the website? I’ve lost count. It may be out of date (extra points if you recognize this possibility and look around for other sources and you won't believe the points I give if you demonstrate you looked in social networks) but it’s the public face. Use it. Goes without saying, but I’m sayin’ it: Treat everyone—everyone—with respect and courtesy. One of my favorite little tricks (now you know) is to make sure we include someone with the title of Administrative Assistant in the interview. If you ignore this person repeatedly, or always and only address your answers to the highest title in the room, you’ve blown it. In higher ed and I’m sure in many other public agencies, departmental secretaries are your best friends and story ideas and resources come from people throughout the entire organizational food chain. If you don’t get that (and if you’re that much of a snob), so long. For a blow-me-away bonus round, send thank-you notes. Handwritten. Personally addressed to individuals you met. This happens so rarely it almost brings tears to my eyes, and it definitely brings a smile to my face. An e-mail thank is better than nothing. If you do that, please for heaven’s sake take the extra 120 seconds it requires to send individual emails rather than a bulk email to the entire committee. This isn't everything but believe me, if you follow this checklist you are miles ahead of most of the applicants. Special PS for "senior" communications practitioners: If you don't think you need to learn anything about this new-fangled social media fad because you have decades of vast experience, think again.